A wonderful large early antique bunch of lock picks or skelton keys. 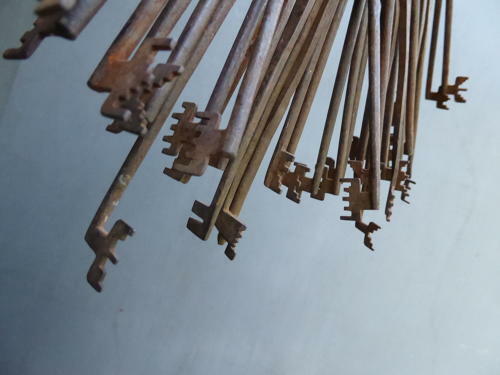 A beautiful, unusually large & very interesting set of forty five iron skeleton keys, each one different & mounted on a large iron ring, all with a fantastic untouched age related patina. Very unusual to come across a set of this size! Late 18th / early 19th century. Wear commensurate with age, excellent untouched original condition. The ring is 15.5cm across & the skeleton keys are between 14cm & 18cm long.